"Orbs are presented as 'evidence' to convince those who've spent a lot of money on commercial spook chases that their time and cash wasn't wasted." Since the introduction of domestic digital photography c.1995, it seems that the field of ghost research has become inundated with photographs of "orbs" - small spheres, of differing colours, sizes and opacity, reputed by some people to be the "Basic Spirit Form" (BSF), the first stage in a manifestation. These pictures first started to appear on the internet, on American websites, and usually chronicled intrepid adventurer's exploits in cemetaries at night - suitable places for ghosts, surely, and so the connection with spooks was made, and has been accepted nearly with question since. But people who have experience with photographic equipment dispute their supernatural origin. Many of us believe orbs are bunkum, and experiments by Phil Walton of ASSAP and Philip Carr of the Ghost Club demonstrate that orbs can be replicated by introducing a fine, invisible cloud of small particles, such as water, dust - even cinamon powder (!) into the air! Furthermore, researchers such as Troy Taylor of the Ghost Research Society have done their own work into this phenomena (see here), and others suggest that the lens of the camera may be at fault. So, why are people so keen to believe that these blobs are anything to do with ghosts? Firstly, ghost hunters are not experts in their field or the use of their equipment and anything odd is deemed "supernatural". Secondly, it does give the orbster something to do: sitting for hours in darkened buildings is pretty boring! So, why are there so many orb photos? Well, I have seen some on 35mm film, but most are digital. I found the reason for this on a vigil in Kent this Summer. My friends were taking dozens of pictures, one after another and would dispense with the pictures that didn't show orbs. At the end of it, they had three or four pictures. The small screen on the camera allowed them to veto the ones they didn't like. Some ghost groups simply take hundred of pictures. 35mm film cameras can't allow such an immediate response as to whether to keep the picture or not. However, my friends did legitimately ask about photos showing just a single "orb": "you can't tell me that this is a single speck of dust". Hence the reason for this webpage, to discuss the scientific merits of orbs. I have written to many digital camera manufacturers (Canon, Sony, Panasonic etc.) and a few firms associated with imagery and photography (Kodak etc.). Of these, Canon was the only one that has replied so far with an answer; indeed, it seems that they were getting such a large enquiry from people about "orbs" that they had produced a technical letter, to be dispensed, like a form letter (this is reproduced below). We have checked your camera and are happy that the camera meets all design specification. The problem you have been experiencing is due to a phenomenon not associated with the camera. When a picture is taken and reviewed afterwards, circular spots may be noticed on the picture. The problem does not occur with every picture. Additionally, the spots are randomly positioned throughout the picture. Highest concentration is in aareas closest to the flash unit when the picture was made. The cause of the problem is common to a lot of digital cameras with small CCDs, not just the Canon digital cameras. Such digital cameras have a greater depth of field compared to 35mm cameras, due to their smaller focal distance. This in even higher degree when the camera is set to wide angle. Because of the above, small dust particles, droplets of water, etc., drifting in the air close to the camera and not within depth of field for normal 35mm cameras, are within depth of field for digital cameras. Under normal circumstances this is not too big a problem, as these are very small. When flash is used, its light illuminates these dust particles or water droplets, and these therefore show up and are extemely obvious on pictures taken. The problem is worsened, because the flash unit is positioned close to the lens barrel. Due to the setup and operation of digital cameras using small CCDs, there is nothing that can be done about this phenomenon. You can take some measures though, to prevent this problem from occurring as much as is possible. Switch off flash in environments where there are likely to be small dust particles or water droplets in the air. To compensate for this lack of flash, you can increase the ISO value on your digital camera if this feature is available on your camera. Use an external slave flash unit further away from the camera and partially cover the camera's flash. These units are not available from Canon, but there are third party companies producing such units. Make sure a slave flash unit is chosen which can also be set to synchronize with the second flash as used by Powershot cameras. With Powershot cameras, the first flash is used to measure, the second is the actual flash. I have, from time to time, evaluated photographs of various phenomena that has been touted as being from unexplained or supernatural origins, strictly from an amateur standpoint. These included mysterious objects in the sky, ghost and seance pics, and 'orbs'. 'CCD' simply stands for 'charge coupled device', which is meaningless unless you're into advanced electronics - but all it refers to is the digital sensor that captures the image. 'Depth of field' refers to the amount of focus distance on either side of the focused 'plane' or any camera or lens. You might focus on an object six feet away, but objects at four feet (closer) and ten feet (farther) are acceptably sharp at certain settings and/or focal lengths. Digital cameras do have a greater apparent depth-of-field, mostly from using shorter focal lengths than film cameras to achieve the same photo. You'll notice that, as something goes further out of focus, it becomes fuzzier, less distinct, and darker. So the lower (shorter) the depth of field on a camera, the less likely you are to see anything extremely close to the lens - it becomes so indistinct that it has minimal effect on the image. With greater depth of field, however, the focus becomes sharper, the objects brighter and more defined. Moreover, as I indicated above, you get a stronger effect when the flash sits very close to the lens, because the reflection of the light is more direct, not as scattered by the oblique angle of the light. Water droplets have an even stronger effect with such flashes, since you can get reflections from both surfaces - the closest one to you, and the back side from light passing through the droplet. I have personally found, however, that to many people explanations such as this are quite unwelcome and may fall on deaf ears. There's just something too compelling about the supernatural. Not too difficult, really. A few days ago I was attempting to get some useful pics of soap bubbles in the air (which is a largely hit-or-miss enterprise). Despite producing a good cluster of bubbles before I hit the shutter release, some pics had very few bubbles, one had only one, some had none at all. That's what digital is for: cranking out lots of shots ;-) And if you're trying for it, you can do it without much difficulty. Release your dust or water droplets (mist) and pause a moment while it almost clears the air - the stragglers will be the only ones caught on film. And creative cropping can produce a nice centered orb if that's what you really need. This is, of course, accounting for the people intending to produce the effect - those that get it accidentally, especially those that believe they caught something extraordinary, can simply be victims of random chance, or the coincidental placement of something in the frame dark enough to show the orb-producer. The frame might have several of them, but you can't see them because the exposure from the lighter background elements overwhelmed them. The amount of pixelation in the image can give some indication of whether the orb has been cropped or enlarged, since digital images always have set resolutions. 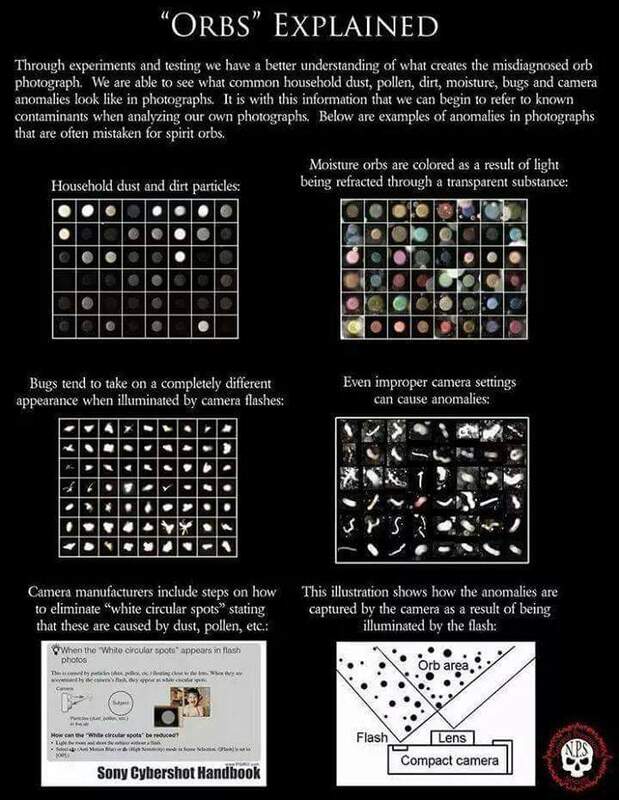 If you're very serious about investigating them, find out what camera has been used, what res setting, and so on, and compare the image you're given (at high magnification). You can often tell if it's been messed with. And then there's the trick of altering levels (Photoshop, at least) to see what range the image has within it. I've found a cut-n-paste job because the original image had lighter 'blacks' than the pasted in bogey, which showed when I blew the levels out into extremely high contrast. It can also show near-invisible wires or background objects. Fun! And it really annoys the believers. But at the same time, it shows that a simple hoax can often be revealed with a modicum of effort. As I indicated earlier, don't expect it to be too convincing, though. It's been my opinion for a while now that the belief in anything supernatural or extraterrestrial fills a psychological niche in the mind of the believer, and thus removing the 'evidence' of such is resisted or outright ignored. I spent a bit of time on the various paranormal and UFO newsgroups - rational explanations are generally not greeted with huzzahs :-). Didn't look around too much, but the website of the ghost investigator was interesting. Very few proponents are concerned about the negative effects of ignorance when evaluating photos, so it was good to see someone who was willing to dismiss routine photographic effects. But I do wonder just where the cutoff line is, since I have yet to see anything remotely resembling 'convincing' for *any* evidence of supernatural activity, so how do you decide what's acceptable? Have fun with it, and don't take it too seriously. There will always be an element of society that distances themselves from the rational. During the course of my own PhD work in biology, I used microscopes a very great deal, and usually used fairly low-quality instruments. A microscope and a night vision unit are, strangely enough, quite similar optically; both use illumination that is very close to the axis of the lens system, and both use very wide aperture lenses. These lens systems have a very shallow depth of focus, and a point source of light (or a black speck on a light background) only appears as such when fully in focus. Put it out of focus, and you get a circular thing with apparent structure inside (caused by lens imperfections). This sort of thing is commonly seen under microscopes, and is ignored as noise. However, night vision makes the situation rather worse than for the microscope. A night vision unit consists of a wide-aperture lens, an image insensifier and an illumination source, frequently stuck right above the lens or in the case of a type of Russian unit, in a housing in the centre of the lens. With this arrangement, where the camera is set to view a room, you have perfect conditions for generating orbs. A small piece of dust a few inches in front of the camera will drift slowly by, mostly in the light beam from the illuminator. Whilst in the beam, it will be a very bright point source but it'll be way out of focus, hence the orb-like form. The dust, too, is easy to generate. No room is completely free of life; there's always a source of dust, however minor. The person setting up a camera, however slowly and quietly they move, will always stir up dust, and after they go the small air currents caused by heating and the like will conspire to keep the dust moving for a while, and hey presto, orbs. The silly thing is that this isn't even an unknown phenomena. Photographers working in caves have long known that if you take a photo with a flashgun close to the lens, you will see only mist. Cave photographers always separate camera and illumination as much as possible, to avoid orbs. Ghost-hunters should learn to do the same, and take separate infra red illumination for cameras. But some people cling to the hope that there are "real" orbs and these are the first stage etc. etc. To them, I say: show me one. "Real" orbs look like "dust" orbs to me. But some people point to a structure inside the orb, such as faces etc. To them, I say: look up the meaning of the words 'simulacra' and 'pareidolia'. Its no different than seeing skeletons in trees and faces in clouds. 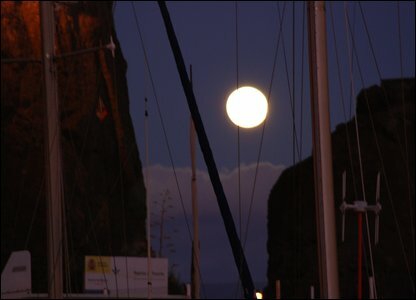 So, is the moon in front of the ship's masts? Of course not. Its just that the moon is brighter and obscures the lines. The same situation occurs with orbs; background objects are brighter and obscure the fainter, much more diffuse and wispy orbs, giving the appearance that they are behind foreground items. Two last points to ponder: why should a paranormal enthusiast know more about optical phenomenon than the people who have spent thousands of man years researching, constucting and testing such cameras? Secondly, the orb enthusiasts may take one picture with a bright orb in it, and take a second moments later with nothing in it. "There were no air currents to move dust around!" they cry. Rubbish, I cry back. Even if you can't feel air currents, they still exist. Look at how a spider's web wafts around even in a supposedly still environment - something that would be impossible if there wasn't the merest hint of air currents. The most ground-breaking recent piece of research into orbs was conducted by Steve Parsons of Para.Science. By taking photos of "haunted locales" using cameras placed side-by-side he has proven that orbs are actually close to the camera. Some sample photos can be found on the Fortean Times website and they show an orb in one photo but not in the other. If they were far from the camera, the orbs would appear in both digital images. Parson's conclusion, after studying 1870 image pairs is that orbs are nothing paranormal. To go up a level, click here. If you're into other "ghostly" phenomena, take a look!